Psychologist Skip Rizzo conducts research on the design, development and evaluation of virtual reality (VR) systems targeting the areas of clinical assessment, treatment rehabilitation and resilience. This work spans the domains of psychological, cognitive and motor functioning in both healthy and clinical populations. 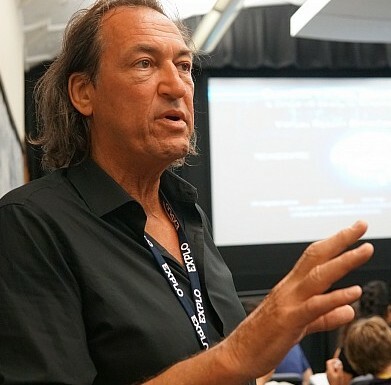 Rizzo, whose work using virtual reality-based exposure therapy to treat PTSD received the American Psychological Association’s 2010 Award for Outstanding Contributions to the Treatment of Trauma, is the associate director for medical virtual reality at the USC Institute for Creative Technologies. He also holds research professor appointments with the USC Department of Psychiatry and Behavioral Sciences and at the USC Davis School of Gerontology. Rizzo is working with a team that is creating artificially intelligent virtual patients that clinicians can use to practice skills required for challenging clinical interviews and diagnostic assessments. His cognitive work has addressed the use of VR applications to test and train attention, memory, visuospatial abilities and executive function. In the motor domain, he has developed VR game systems to address physical rehabilitation post stroke and traumatic brain injury and for prosthetic use training. He is currently designing VR scenarios to address social and vocational interaction in persons with autistic spectrum disorder. Rizzo is currently examining the use of VR applications for training emotional coping skills with the aim of preparing service members for the stresses of combat. He is senior editor of the MIT Press journal, Presence: Teleoperators and Virtual Environments. He also sits on a number of editorial boards for journals in the areas of cognition and computer technology (Cognitive Technology; Journal of Computer Animation and Virtual Worlds; Media Psychology) and is the creator of the Virtual Reality Mental Health Email Listserve (VRPSYCH).